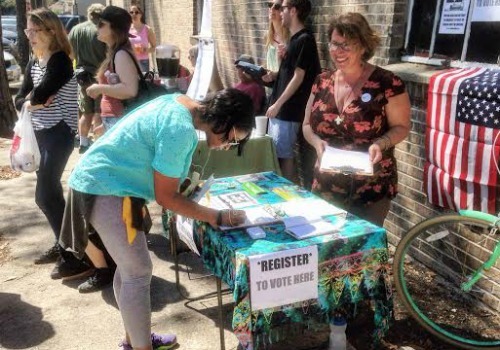 Caption: The Green Party of New Orleans conducts a voter registration drive at Second Line Brewing on Saturday after the Tenth Annual Hike of the Laffitte Greenway (Photo by Bart Everson). I didn’t vote in Saturday’s primary. I wasn’t allowed to. I’m one of those “others.” We make up a quarter of the registered voters in this state. On Saturday we sat on the sidelines and were not allowed to participate in the primary, though it was paid for with our tax dollars. You might think I’m an independent, as most “others” are, but I’m not. I’m a registered member of Louisiana’s fourth largest party, right behind the Libertarians. I’m a member of the Green Party of Louisiana. Much like the Republicans and Democrats, Libertarians and Greens have our own candidates who are actively seeking the nomination of our parties to run for president. So why didn’t Greens and Libertarians have a primary here in Louisiana on Saturday? It’s because we have less than 40,000 registered members, which is the rule in our state. 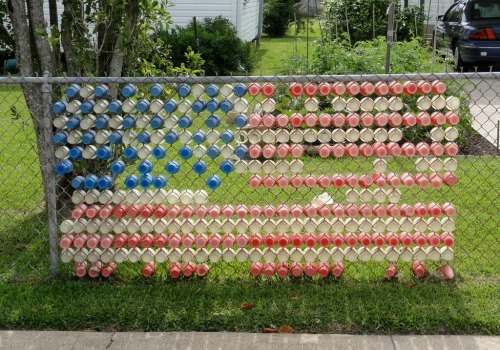 (The Libertarians aim to hit 40,000 by the next presidential cycle, so watch out.) In the meantime, we may wonder what purpose is served by keeping the smaller parties out of the Presidential Preference Primary. Are we afraid of too much democracy? So-called “third parties” are often marginalized and denigrated as weird, eccentric, or downright crazy. For that reason, it’s been amusing to observe what’s happening with the big parties in this wild and wooly campaign cycle. Bernie and The Donald might seem like polar opposites, but they have at least one thing in common. Bernie is not a real Democrat. The Donald is not a real Republican. They are both outsiders, both “pushing in” and threatening the established political parties. Politics aside, the key difference is that the Donald’s coup is looking to be the successful one. Our national political discourse has devolved into a reality TV show. The Donald understands this fact and has exploited it to his advantage. I’m revolted by The Donald but fascinated as well. As a student of the media arts, it’s hard not to admire the masterfulness of his manipulation, even while I deplore it. He’s got the leaders of the GOP and conservative pundits alike quite worried, and that’s gratifying. The Germans have a word for this, I believe: Leiderhosenvonkrappenfreude, or taking pleasure in seeing your enemies crap in their pants. Will he actually destroy the Republican party? I don’t know, but hope springs eternal. (Photo courtesy of Bart Everson). But that was a very long time ago. The joke fits better on the Republicans now. The Democrats are quite well organized, and they’ll prove it when they quash Bernie’s revolution. My ideals are much in line with Bernie’s. I love his focus on income inequality. I love how he’s inspired so many people to get involved and get active, especially the young and those alienated from the political process. However, I don’t think Bernie will do to the Democrats what The Donald is doing to the Republicans — more’s the pity. After I saw Bernie speak here in New Orleans last summer, I rejoiced in his message but despaired of his chances. The oldest and most powerful party in the world will never run Bernie for the most powerful office in the world. I’d love to be proven wrong. I’d love to see the Democrats nominate Bernie. But that’s a decision for others to make. I’m not a Democrat. I’m registered Green because I subscribe to a radical notion: the change we need won’t come from within either of the deeply entrenched political parties that dominate our government. This was something Bernie himself seemed to believe until fairly recently. So where does Bernie’s revolution go, once Hillary gets the nod? What happens to all the energy and excitement Bernie’s campaign has generated? I hope it will not dissipate. I encourage Bernie’s followers to stay active and stay involved in the political process. Now that the Louisiana primary is past, I’d like to suggest that Bernie supporters give the Green Party a look. I don’t mean voting for the Green candidate for president in November. That would be nice, but there’s more to do. I’m talking about growing a party in our state that takes our ecological crisis seriously, a party that looks to #BlackLivesMatter for leadership, a party that serves our grassroots movements.